animal | i'm on an adventure! Dedicated to B, who asked. I would love to help you in any way that I can! You rock! First place to start: http://vegankit.com/ – Great overview of everything! The resource I am most excited about at the moment is Mercy For Animals Vegetarian Starter Guide (http://www.mercyforanimals.org/VSG.pdf). It’s free online but is also mostly the same as their website: http://www.chooseveg.ca/ (I totally worked on this haha). It has some info about the animals (nothing gory), environmental impacts and positive health benefits. It also has some basic nutrition info (http://www.chooseveg.ca/foodplate). 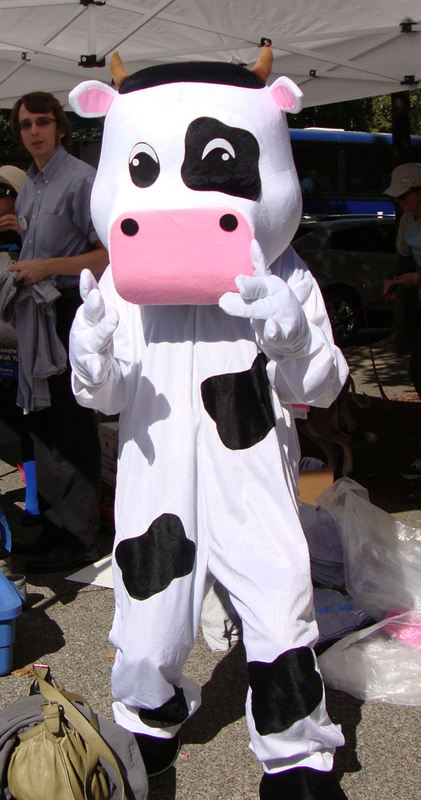 The meat and dairy lobbies pay actors and people to advertise and promote their products (got milk?) because they are industries seeking to make more profits. I was really shocked when I learned that many of the supposed benefits of animals products are just marketing lies. For example, milk can actually CAUSE osteoporosis by leeching Calcium from the bones (http://www.news-medical.net/news/2005/09/12/13120.aspx) and even Harvard no longer promote consumption of milk and dairy products (http://www.hsph.harvard.edu/nutritionsource/). Another big one is the “protein myth”. Meat companies promote their products as having “enough” protein, but no one even mentions how much protein people really need. Many people eat too much protein which can cause problems. All fruits, vegetables, and plants have protein. Even if you wish to eat large amounts of protein (which is generally unnecessary) there are many plant based sources you can use such as Kale, Lentils, Beans, Hemp Seed etc. There are also lots of all vegan restaurants in the lower mainland: Karmavore in New West, Graze on Fraser, 3G Downtown, Dharma Kitchen near UBC and Vegan Pizza House near Joyce Station are some of my favorites. Lots of common restaurants also have vegan options. I like getting veggie sushi rolls, veggie sandwiches from Subway, and veggie or tofu stir fries when I am in a rush (but I always ask to make sure the sauces and ingredients are vegan). In terms of becoming vegan, everyone has their own path. I know people that switch overnight cold turkey and others that transition slowly. I myself went vegetarian over night and then slowly eliminated things from my fridge until I was vegan 4 months later. Melanie Joy, a psychologist who did her Ph.D on why we eat animals has a really great site and 2-minute video about why we eat animals which has really helped me to understand the importance of animals rights and ethics (http://www.carnism.org/). Beyond the nutritional info I think the most important part of being an animal advocate is being well informed. This short video of undercover factory farm investigations helped me to learn about how animals are treated and WHY it is so important to be vegan: http://meatvideo.com/ I found the video very disturbing, but I think it is important to witness the suffering that goes on and be informed about what really happens in the factory farm industry. If you have more time Earthlings is a very comprehensive look at how animals are treated in our society. It is available for free online: http://earthlings.com/?page_id=32. 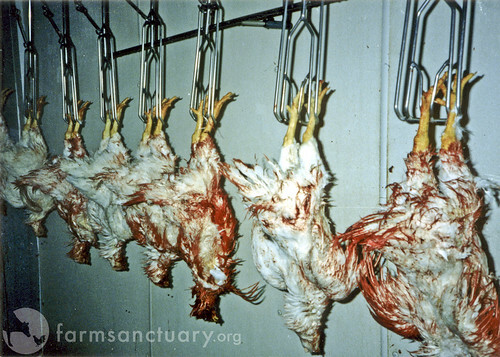 Again, this movie can be quite disturbing, but it is likely that people are going to ask you why you don’t eat animals, and I think it is important to know the facts. Note: As with anything, I highly recommend doing your own research, being critical of all sources and coming to your own conclusions after you have done adequate research and learning, especially when it comes to nutrition. Right now I am two weeks away from finishing my main summer course: The Semester in Dialogue, topic: Sustainable Food Systems. I have been very sad and frustrated lately engaging so frequently with what is happening to animals. We have to write a weekly reflection so last week I wrote this vindictive and annotated rap. Enjoy. Fulkerson, L [dir.]. (2011). Forks Over Knives [Film]. USA: Monica Beach Media. Michael Ableman, Personal communication, May 11, 2012. Mark Winston, personal communication, June 1, 2012. Mark Robbins, personal communication, May 31, 2012.
would you say that nature’s right is here? for some bacon and a burger, kay? live in honor and stop the pain. I went to a storytelling event. It was really amazing to hear all of the stories… There was sadness, happiness, and mystery in all of them. The biggest thing I took away was not from a story though – it was from the dog. When I was younger I was afraid of dogs. It took me a long time to get comfortable with dogs but now I am often the person a dog will spend most of the night getting rubs from. I like to think it’s because I am vegan. Reason to be Vegan: Ducks! I’ve decided i’m going to start doing a weekly feature on awesome animals and vegetables to promote how wonderful veganism is. This is a step I am taking to “become the change” and create the world I want to live in. These features will highlight awesome nutritional, compassionate, and environmental reasons for my own personal vegan lifestyle. Today, Ducks! Enjoy these cute photos! 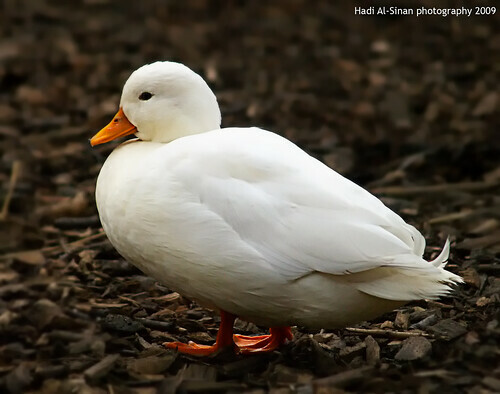 Despite widespread misconceptions, only the females of most dabbling ducks “quack”. For example, the scaup – which are diving ducks – make a noise like “scaup” (hence their name), and even among the dabbling ducks, the males never quack. 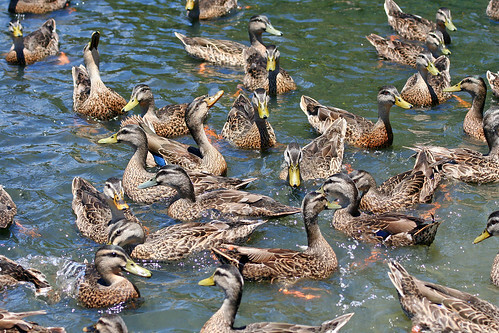 In general, ducks make a wide range of calls, ranging from whistles, cooing, yodels and grunts. Calls may be loud displaying calls or quieter contact calls. 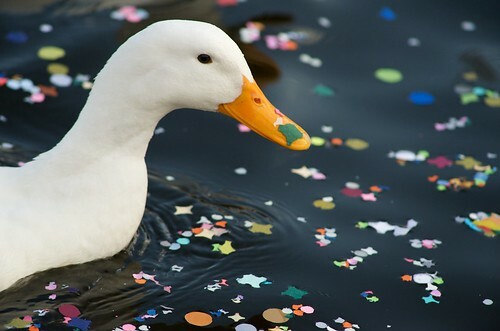 In 2002, psychologist Richard Wiseman and colleagues at the University of Hertfordshire, UK, finished a year-long LaughLab experiment, concluding that of all animals, ducks attract the most humor and silliness; he said, “If you’re going to tell a joke involving an animal, make it a duck.” The word “duck” may have become an inherently funny word in many languages, possibly because ducks are seen as silly in their looks or behavior. Of the many ducks in fiction, many are cartoon characters, such as Walt Disney‘s Donald Duck, and Warner Bros.‘ Daffy Duck. How can we compare and rank creatures on a scale? Is one creature really any better than another? I think that we are all part of the whole. Just because I as a human can’t see the intelligence and consciousness of another species, doesn’t mean it isn’t there. Maybe their consciousness is so far advanced or removed from my own experience that I will never begin to comprehend it. 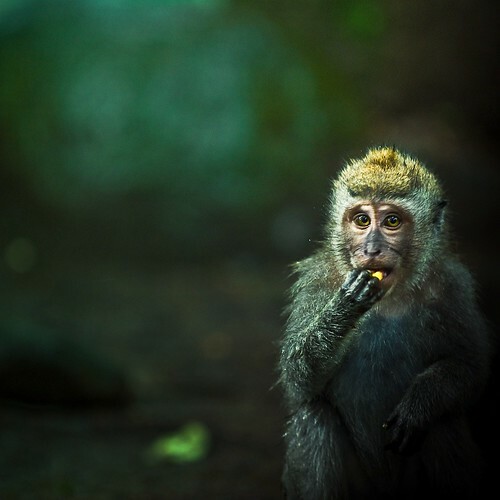 Some researchers use “self-awareness tests” to determine if animals are consciousness. Many of these tests use mirror to detect if animals can recognize themselves. I think that these tests are highly flawed because of their lack of collective conscious analysis. Maybe our so-called “superior” sense of self is our biggest limitation. Perhaps our separation thinking and singularity is what restricts us from really evolving. Instead of looking at evolution and ranking various species and studying development, I think we should spend more time on transformation. Growing, not changing. OH MAN JUST HAD ANOTHER THOUGHT! This is a room without a window. People tend to think that sunlight is not coming into the room when there is no window. If plants could be conscious could LIGHT be conscious? or sound? Let’s take light. Maybe it is the highest form of consciousness, pure energy. Wow. Animals are everywhere. We are all animals. I had an interesting conversation about how people are, in fact, animals. We have instincts and such a big part of life is learning to control them and exist with one another in a respectful and compassionate way. We are evolving like every other species. We like to think we are separate from the other creates on this earth but we have so much in common, how can you deny it? I guess that’s part of the reason I am vegan. I have learned to live differently, I do not need to eat my brothers and sisters. We are one family. BE LOVE. A friend linked me to these amazing “Fennec Foxes”. SOOOO CUTE! Click for moar! The true arctic ninja. Thank you google image search for making my day. And then I went downtown to see Hanson play. Fun Stuff! That’s the most romantic thing i’ve heard today haha!